Cut a large sheet of wrapping paper from the roll. I find a sheet approximately 2 feet by 3 feet is a nice size for this project. Lay the wrapping paper on the floor and scatter the markers, paint sticks, dotters, and glitter glue around the wrapping paper. Encourage your little artist to move around the paper and add colors, doodles, and pictures from different spots on the floor. They can even lay down on the floor and reach across the paper to make big lines. If you are concerned about the floor getting messy, move outside, or cover a table and move the paper occasionally so artists can reach all the corners. Add glitter glue to give the wrapping paper an extra sparkle. Let dry and wrap a gift for a friend or family member. I found wrapping paper in solid bright colors at the dollar store. Stiff brown wrapping paper which also worked well for this project. Traditional wrapping paper is thin and rips easily, remind your little artist to draw and paint gently. Before or after your D.I.Y. 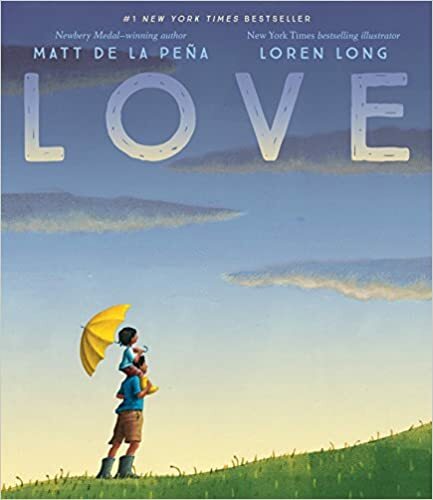 wrapping project, read the book Love by Matt De La Pena and Loren Long together with your little artist.